Please give us an overview of Rosenblum Silverman Sutton Investment Counsel’s (RSSIC) investment philosophy. We are committed to earning our clients’ confidence and trust through dedicated personal service and expert management of the investment process. It is our mission to listen, understand and take action based on our clients’ unique needs. We believe that investment management is a service business. The best decisions are not necessarily those which yield the highest numbers, but rather align themselves most closely to client needs, goals and comfort level. Rosenblum-Silverman-Sutton invests in high quality companies whose growth in earnings have the potential to provide returns in excess of the market, while protecting clients’ principal in down markets. We approach the stock market thematically, looking for investment ideas that permit an effective response to market developments on the horizon. By pursuing themes that cut across sectors and industries, we seek to capitalize on changes in politics, inflation, interest rates and broad social changes. Equity selection begins with the identification of promising market segments and then companies that are likely to deliver above-average returns to shareholders. We favor companies with a conservative capital structure that generate cash flow internally to fund growth and whose management functions with their shareholders’ interests in mind. Health care trend setters (Bio-tech enhanced discovery process has opened the door to new drugs). We emphasize companies with superior management, solid balance sheets, sound accounting principles, extensive research and development, market headers/barriers to entry, substantial unit growth, ongoing new products/services, and prices which do not already reflect the growth prospects indicated by our research. What is the history behind RSSIC including the motivation behind the founding of the firm? Rosenblum-Silverman-Sutton (100% women owned) was founded in 1975 by Barbara Rosenblum; joined by Phyllis Sutton in 1984. Both principals have over 40 years of experience as portfolio managers and equity analysts. Our successful business was built upon our focus on individual client needs. During volatile times, we held the course, accumulating both the assets and new clients that have brought the firm to the size and reputation it currently enjoys. We are now managing financial portfolios for children of investors who have been with us since its predecessor’s founding by Barbara Rosenblum. Please give us a portrait of your typical client and how they learned about your investment service. Our firm provides investment management services to a wide variety of clients. Clients have several important characteristics in common such as accepting some level of market risk to preserve purchasing power, a willingness to delegate the daily decision making, and a desire to work with an advisory firm that provides a high level of personal service and assures total confidentiality. Every portfolio is individually invested and administered according to the client’s specific plan. Individuals learn about our services from current clients, brokers, CPAs, lawyers and our web site. Tell us about the two services you offer, managing investment portfolios and working as a fiduciary by assisting customers in all their investment affairs. We offer two services. The primary one is customized portfolio management, and the second is dedicated personal service. We value the confidence our clients have demonstrated by choosing us to manage, preserve and build their financial assets. And we view their participation in the investment process as critical to its ultimate success. Our team acts as financial quarterbacks advising clients on mortgage needs, funding for a real estate venture, forming an estate plan,financing higher education and/or referring to an appropriate legal, mortgage and estate counsel. How do you differentiate yourself from other private account investment firms? We believe we stand apart from many other investment firms because we are 100% owned and managed by women, we have a 30 year track record compiled by the same principals and every portfolio is individually invested. By carefully managing our growth, we are able to know and work closely with every client and provide the consistent, individualized attention that sets RSS apart from many other financial institutions and asset management firms. We do not offer products or model portfolios. What is the process behind the customization of a clients’ portfolio to their investment objectives? Customizing each portfolio to an individual’s unique situation begins with meeting personally to determine if our services are the right fit. At RSS we perform a comprehensive review of financial circumstances, identify financial and investment goals and explore unique concerns. By listening and understanding goals, we are prepared to take proper action and to monitor and adjust portfolios based upon needs. We strive to understand financial stages in life, risk tolerance, challenges, tax considerations and investment goals. After exploring these questions, we can identify the most prudent and productive way to allocate funds among various asset classes. How does your team approach work? Clients benefit from our unique approach because the two principals manage all portfolios as a team. Therefore, if one principal is away from the office, clients feel comfortable knowing the other is familiar with their accounts and personal situation. What investment instruments do you typically use and how do you apply them? We invest in stocks, bonds and mutual funds for our clients. The allocation between these investment options is determined by each client’s unique circumstances, risk preferences and investment horizon. The majority of our holdings, however, are in the stocks of U.S. based companies. We tend to focus on faster growing companies with a unique niche focus or differentiated market strategy where there is a discrepancy between the market value and our assessment of intrinsic value. Bonds are purchased to provide current income and lower portfolio volatility. Client portfolios typically hold a combination of corporate and municipal bonds and, to a lesser extent, government securities. Mutual funds are used to achieve diversification in cases where a portfolio of individual securities isn’t possible or desirable. For example, a biotechnology ETF such as the Market Vectors Biotech ETF allows us to provide clients with exposure to biotechnology companies without taking the binary risk sometimes associated with individual companies. Similarly, we may expect outperformance for a geographic region or country and buy appropriate ETFs to execute the strategy. Please explain your top-down thematic analysis. 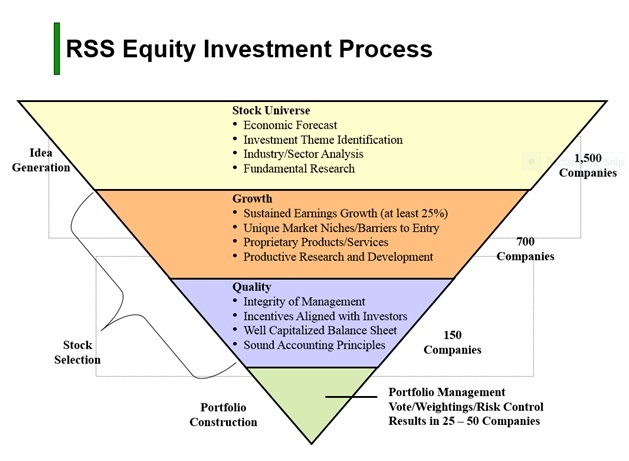 The investment process overlays a bottom-up fundamental analysis of individual stocks with a top-down thematic approach. We identify sectors of the economy that are poised to change in some fundamental way, e.g. faster growth, consolidation, product innovation, changes in the structure of costs, etc. and look for companies that are benefitting from those changes. We also pay attention to changes in consumer behavior, new technologies, supply chain changes, political and regulatory events, etc., and focus on the beneficiaries of these developments. Online shopping has changed the bricks and mortar retail world; DNA sequencing is revolutionizing drug discovery; mobile communication is altering consumer behavior and cloud computing is uprooting traditional software and infrastructure. There are typically a handful of companies through the vision of their executive management team or through creative product development and marketing that are at the forefront of these changes. If we can identify the companies that are leading these trends, significant investment opportunities typically emerge. Where do you get your investment ideas and how do you go about doing your investment research? We attend investment conferences in which companies in a wide variety of industries make presentations and hold meetings for investors. This gives a perspective not only about the attending companies but views about competitors and industry trends as well as the opinions of other buy side investment managers. We receive sell-side analyst reports covering companies, industries and economic data and analysis and read industry and financial publications as well as company annual reports and other SEC filings. We meet with analysts, talk to company executives and take “field trips” to company facilities. Some investment ideas can simply be the result of reading the newspaper, talking to friends or asking questions of people in the businesses themselves. Once we find companies that we like, we sift through all of the available published information and perform extensive analysis of the financial status of the company. What economic trends do you follow, how do they relate to your investment theme development, and how do you translate those findings into your stock sector selections? Theme development is part serendipity, methodical review of economic data, experience, discussions with industry experts and interpretation and analysis of business trends. Our big picture assessment of the economy is based on evaluating a broad set of economic indicators including employment, GDP, housing sales and prices, industrial production, durable goods data, consumer confidence, income and spending trends, vehicle sales, etc. We also review the opinions of market strategists. As this information is reviewed, ideas are generated about sectors of the economy that are undergoing change in terms of innovation, new products, competitive dynamics, etc. or that may be impacted by external events. For example, an improvement in monthly auto sales may suggest a developing trend that some manufacturers, suppliers or distributors are capitalizing on through new product introductions, changes in strategy or marketing initiatives. Beneficiaries of these changes are identified and evaluated for suitability as an investment. The process can work in reverse in which our analysis of a company may suggest to us broader themes and trends implied in management’s strategic vision. How much weight do you give to your management findings, technical analysis, and fundamental research when structuring a portfolio? Our stock selection process is rooted in fundamental analysis. This consists of an evaluation of the company’s financial statements and other available company materials such as conference presentations, SEC filings, quarterly earnings conference calls and one-on-one meetings with management. This work is supplemented with a review of sell-side analyst research and input from industry contacts. Information from financial and industry publications are also considered in evaluating a company. Sell side financial models are examined to determine the leverage points, sensitivities and balance sheet risks of the company. Bloomberg analytics provide data on such things as margin trends, historical valuation ranges, comparable companies and changes in analyst estimates. Technical analysis may be used in timing the purchase or sale of stocks after the decision to buy or sell has been made. What proportion of your stock holdings are invested in non-US companies? The vast majority of our holdings are U.S. based companies. However, if a compelling international theme emerges or if we learn about a unique foreign based company, we will invest in non-U.S. incorporated companies provided the shares trade on a U.S. exchange. We may use mutual funds that invest internationally if there is a country or region that offers potential rates of return that may exceed our expectations for the U.S. at certain periods through an economic cycle. It’s not unusual for us to have some international exposure which helps portfolio diversification. How do you structure your fixed income accounts and how do you determine the allocation between your stock and bond holdings? The strategy for the fixed income portion of balanced portfolios and fixed income only portfolios is the same. After taking into account the client’s circumstances, including risk profile, current income needs and time horizon, a laddered and diversified set of bonds are purchased focused on investment grade corporate, municipal and government securities that maximize yield and minimize credit risk and taxes. The allocation between fixed income securities and stocks is determined in the initial consultations with prospective clients prior to signing a management agreement with us. This is based on the need for current income, anticipated capital expenses, risk tolerance, tax situation or other unique circumstances. Please tell us your strategy for controlling market risk and whether there are times when you reduce your portfolio positions by raising cash holdings. We manage risk primarily through diversification of stocks including the number of positions held, position size, sector weight and allocation between asset classes. Portfolio characteristics such as beta, market capitalization and debt are also considered. We may use ETFs or mutual funds from time to time to further enhance the diversification of our client’s portfolios both for fixed income and equity investments. Higher levels of cash are maintained to reduce market exposure during periods of expected economic weakness. What is the annual turnover of a portfolio and how many stock positions would I expect to own? Our turnover tends to be low; however, there can be fairly wide fluctuations in the percentage from year to year. For stocks, annual turnover is in the 20% to 50% range. For bonds, turnover is more consistent from year to year, ranging from 20% to 30% annually. Portfolios are fairly concentrated because we build larger positions in our high conviction, core holdings. Most clients own 20 to 30 stocks, however, clients who choose to invest in some unmanaged securities may have more. Do you handle all equity portfolios the same or do you treat taxable accounts differently from nontaxable accounts? Taxable accounts are handled differently from non-taxable accounts. Tax consequences are considered for various investment alternatives and balancing capital gains and losses. We employ up-to-date and effective tax planning strategies to minimize clients’ tax liability. Who are the major principals of the firm and what are their backgrounds and functions? 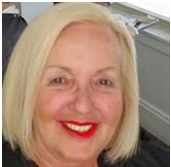 Barbara Rosenblum and PhyllisSutton each have over 40 year’s experience as analysts and portfolio managers. Both are the portfolio managers at RSS and operate as a team. Along with our analyst, they also serve on the investment committee. The breadth of knowledge and industry experience we bring to all phases of the investment process are key components in achievement of our clients’ financial objectives. What kind of support do your clients get and how often do you communicate with them? We have an “open door” policy whereby clients can call, or e-mail to schedule a visit with a principal as often as they wish. Quarterly, we issue reports on the status of the portfolio, along with our market outlook. We ensure that clients will be involved in the development of the tailored investment plan, informed about the trading and ongoing management of the portfolio. Clients are confident that questions and concerns will be addressed with honesty and timeliness. Can I domicile my account anyplace or do you usually recommend a firm? Accounts can be domiciled anywhere but we can recommend a firm where the majority of accounts have custody. Do you offer a monthly newsletter and where can someone find out more about RSSIC and the services you offer? We have a monthly newsletter which can be found on our website www.rssic.com. We believe we do two things exceptionally well. We make money for our clients and we take very good care of them. In an industry dominated by quantitative considerations, RSS never forgets that the individual investor comes first.